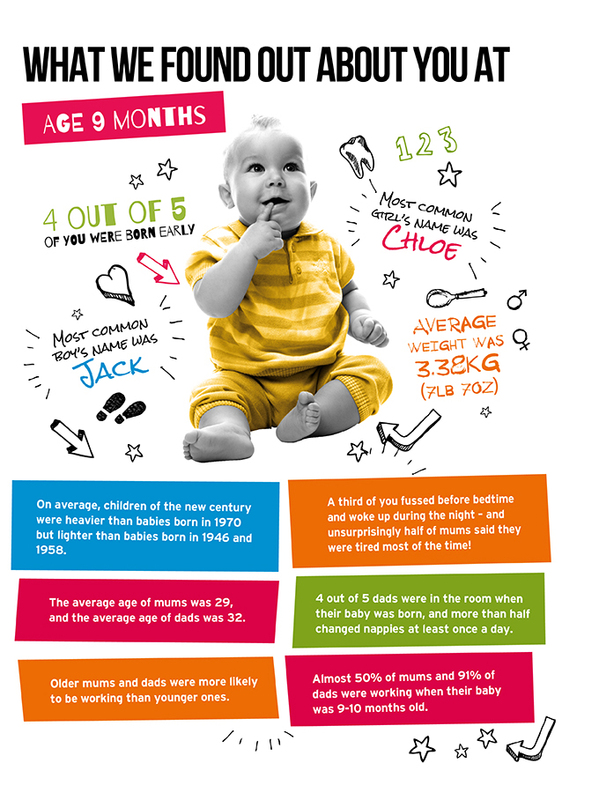 The Age 9 Months Survey took place in 2000-01, with information gathered from 18,818 babies and 18,552 families. NatCen interviewers carried out the Age 9 Months Survey in England, Wales and Scotland, and the Northern Ireland Statistics and Research Agency (NISRA) carried out the survey in Northern Ireland. Were you born in a hospital or at home? Were you early or late? And how much did you weigh? Believe it or not, the circumstances when you were born can affect you for years to come. But those first few months of life are equally as important. Around this age, many babies learn how to do things like sit up, roll over, stand, crawl (or bottom shuffle!) and clap hands. A few may even start walking. It’s also an important time for families. New mums and dads are getting used to being parents, while other families are welcoming a little brother or sister. We surveyed your families when you were 9 months old so we could gather important information about your birth, early development, and how your parents were getting on with a new born baby at home! What did we ask your parents? We asked about your home life – who lived at home with you, whether you had any brothers or sisters, and if you saw grandparents or other relatives regularly. We also asked what kind of house you lived in and what your neighbourhood was like. We asked your parents about their relationship, what they did for a living, and whether they had been to school or university. We also asked a lot of questions about your health, your parents’ health, and if you had started to do things like stand up, crawl or wave bye-bye. We also asked your mums if it was okay to get information from the National Health Service (NHS) about when she was pregnant with you and when you were born. The NHS collect information when people go to the doctor, go to hospital or visit any other health professional. Children with a disability and their families face other risks as well, according to findings from Child of the New Century. Took place in 2001-2. Gathered information on 18,818 babies from 18,552 families NatCen interviewers carried out the age 9 months survey in England, Wales and Scotland, and Northern Ireland Statistics and Research Agency (NISRA) interviewers carried out the survey in Northern Ireland.